Born in Nadia, West Bengal. 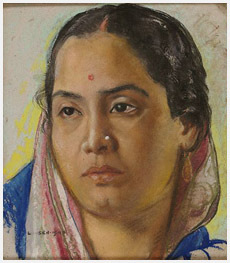 1912 Shifted to Lucknow from Nadia. 1926 Associate for mural decoration, Royal College of Art, London. 1929 Appointed Superintendent, Drawing and Teachers Training Class, Govt. of UP, Lucknow. 1929 Selected to decorate the Viceroys House, now Rashtrapati Bhavan, New Delhi. 1931-32 Selected by Govt. of India to decorate India House, London. 1912-17 Studied at Govt. School of Art, Lucknow. 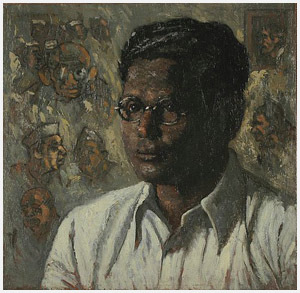 1925 Studied at Royal College of Art, London. 1925 Exhb., Royal Academy of Art, London. 1933 Exhb. of Indian Artists, organised by AIFACS, Fine Arts Society, London. 1925 Awarded scholarship to study in England. Lalit Hall was named after him, Govt. College of Art and Craft, Lucknow. 1918 Taught Commercial Art, Govt. School of Art, Lucknow. 1945 Principal, Govt. School of Art, Lucknow.